Ewan McDairmad's School for Boys was a busy place. Boys ran about all day long, except when they were in class, or studying. April 1st was a school holiday. The boys climbed into a big yellow bus and headed for the park. They were going to have a picnic and watch a game of football. Their headmaster, Mr. Crawford, told the boys that if they behaved, they would get a special surprise at the end of the day. All the boys did their best until they got to the football match. The bench they were to sit on was only big enough for ten boys, but there were twelve of them; Gillespie, Hamish, Innes, Kade, Kendrew, Leith, Mirren, Nairn, Niall, Payton, Roslin and Struan. 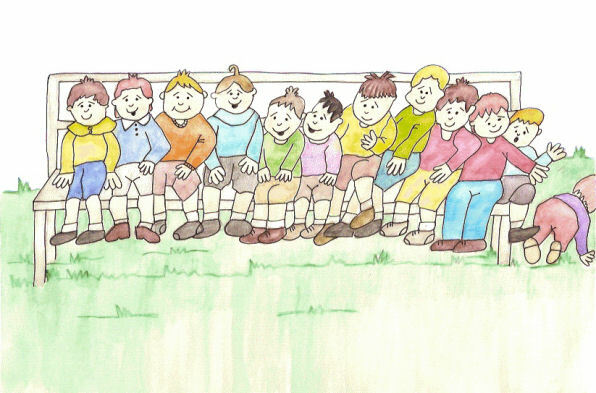 When the headmaster told them to sit quietly, the twelve boys ran to the wooden bench. All of them fit nicely except Roslin and Struan. There just wasn't enough room. The headmaster stood talking to one of the football players and didn't see Payton push the two younger boys off the bench. Roslin and Struan kept trying to climb and squeeze next to Payton, but he kept pushing them off. The headmaster turned around and saw the two boys on the ground and let Roslin and Struan sit on the bench. When they were having the picnic Payton took Roslin and Struan's cucumber sandwiches and ate them himself. That night all the boys, except Payton, got to have a special surprise, chocolate covered biscuits. The headmaster took him into the other room and explained that anyone who attended Ewan McDiarmad's School for Boys should never push or bully the younger boys. Payton felt sad. He told the headmaster he would never do it again and apologized to Roslin and Struan. The headmaster was pleased and gave Payton a biscuit after all.